Girls Who Draw is a collaborative outfit based in the UK with the likes of Yee Ting Kuit, Gemma Correll, Anke Weckmann, Mary Kilvert, Sarah Ray, Kate Hindley, Ruth Green, Currentstate, Karoline Rerrie and Michelle Turton who join forces every year to produce a postcard book. 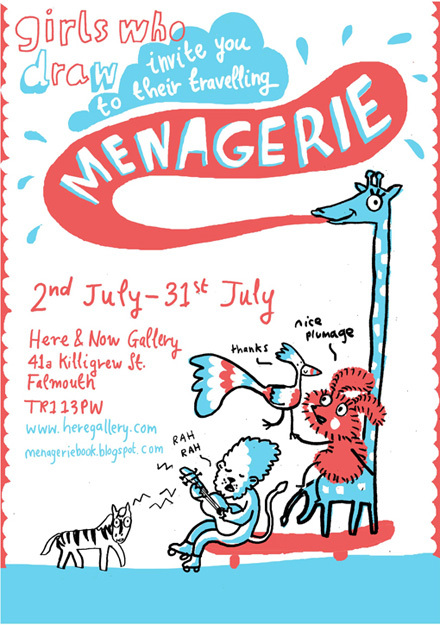 This July, they’re going to exhibit at Here & Now gallery bearing the theme Travelling Menagerie, with previous postcard books on show as well as the 10 ladies debuting new works made especially for the exhibition. More information about the ‘Menagerie’ postcard book can be found at www.menageriebook.blogspot.com!